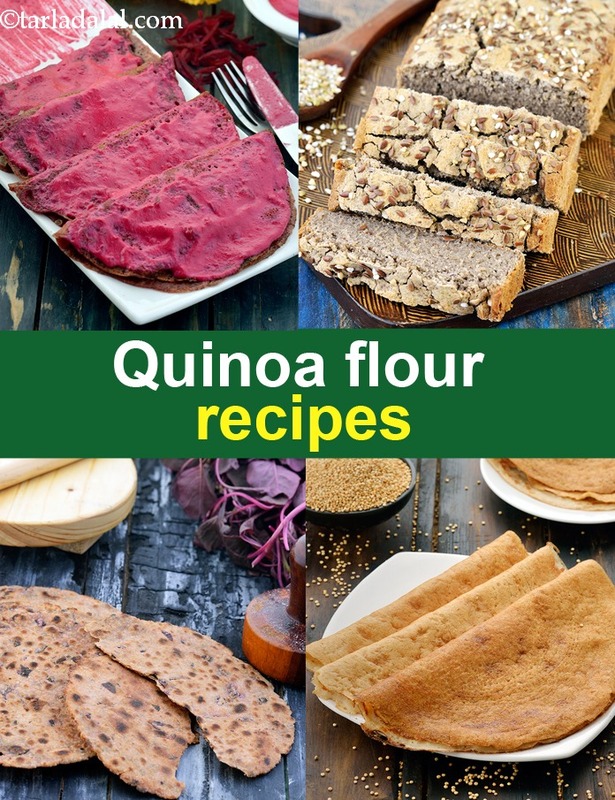 quinoa flour recipes | Indian quinoa flour recipes. Quinoa is a little similar to buckwheat. Quinoa flour is made by grinding quinoa grains into finer particles to get flour. It is creamy yellow to ivory white in colour. Quinoa flour is a healthy option for those who are gluten intolerant and way healthier than plain flour when used in snacks. Quinoa and buckwheat combine to make a nice gluten free bread which has some rice flour added to it. Make this buckwheat and quinoa bread recipe which is pretty dense. Yes, quinoa flour works really well for Indian food. Traditional Indian upma recipe is made of semolina and not healthy as rava is used. Read is rava healthy? Try this Quinoa upma recipe which is made with onions, green peas and carrots to add more fibre and is gluten free. The classic dosa recipe used rice and urad dal. While it is healthy, it is not the perfect dosa to have as it contains rice. Read is dosa healthy? Have this quinoa dosa recipe as it contains ZERO rice and is super healthy. Made with quinoa flour, urad dal and whole wheat flour. Quinoa flour and ragi combine well to form the base for a Indian pancake to which mushrooms and water chestnuts are added. Try this innovative quinoa ragi pancake with beet feta cheese sauce recipe which can be has for dinner as part of the main course as the recipe is very filling. Quinoa flour : Quinoa flour lowers cholesterol and reduces heart diseases. The soluble fibre in this grain gains the credit of reducing the total blood cholesterol and LDL (bad cholesterol) levels in our body. Harnessed with nutrients like protein, calcium, phosphorus and magnesium, quinoa flour has been considered as the bone-building power grain. Quinoa flour has potassium and magnesium – the two key nutrients which help to lower high blood pressure. See detailed benefits of quinoa. Enjoy our quinoa flour recipes | Indian quinoa flour recipes below.